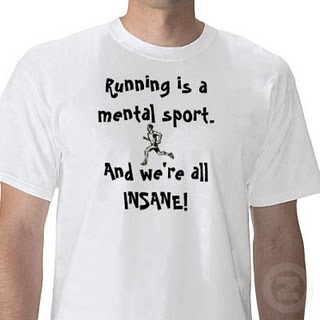 I know you might think I’m crazy but I do believe that more than anything, running especially long distance running is a mind game. Case in point, I probably outweigh one of my running buddies by about 10 pounds. We have the same height which means we probably have the same leg length. She’s a gym buff and I’m an overweight, workaholic who barely has time to workout. I can run a 10k race faster than her by probably 10-15mins. Make it even a 21k run. Why is that? Because she doesn’t believe she can do it. It’s all about mental preparedness. It doesn’t mean that I eat a 10k run for breakfast, it just means that I mentally KNOW I can finish a 10k run. I can envision that finish line, I can see myself crossing that line and I cannot wait for my after-run breakfast. Amongst the running group I have joined, I am most active in a team called Team CB. Our team’s motto is “di masyadong mabilis, pero cute” (we’re not that fast but we’re hot…no i meant….cute”). And as funny as it is, this statement is so true! Except for the cute part. You be the judge of that :p When you look at some of our member’s race finish times, you would see that most of us would be average to slow. Of course, there are those who run, whatever the distance, as if they’re being chased by a pack of wolves…Wilnar, Earl, Argo, Allan, Tere, Grace….our breed of monsters. And there are those like me, who are a bunch of slackers (sorry guys) but have happily finished at least one marathon. And there are those who may have ran their 1st full marathon, the slowest amongst the team, but have conquered a 102k ultramarathon. Unbelievable you say? Believe it because it’s the truth. You might be thinking that these guys are probably the perfect athletes who train almost everyday, who probably have bodies like Gods and Godnesses, who live, breath and drink running. Well some do but I kid you not when I say the majority DO NOT. 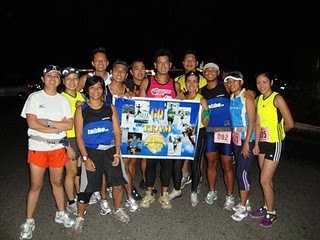 I can say though that they live and breath videoke and out of town group trips ;p And yet they have achieved so much by finishing at least a 102k ultramarathon and some even a 160k ultramarathon. AMAZING!!! As they would always say, it’s all in the mind. They believed they can and they did. They knew that they can cross that finish line and they did. They knew that they are mentally and physically prepared and prepared they became. Preparing to run a long distance race takes a lot of physical effort and a lot more mental preparation. Even if you are as fit as Sylvester Stallone during his Rocky days, if you don’t believe you can run even 21k, then you won’t be able. Haha, so ngayon lang ako nagvisit ng blog mo diba? Agree, mental preparedness. Determination and Heart. Sabi nga sa P90X, Decide, Commit, Suceed! – why not??? go go go! Dyules!!! This was written ages ago! Now I can say that I am not mentally prepared for 102k. Haha!